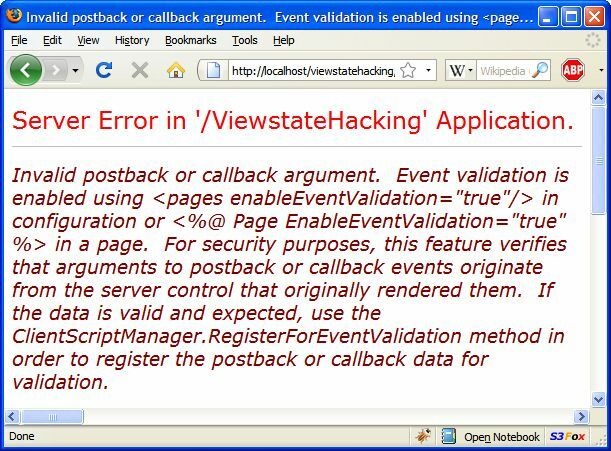 Something I’ve pondered previously: an ASP.NET page is populated with data retrieved from ViewState, is it possible to falsify the ViewState in the POST and trick the server into doing something that it shouldn’t. In other words, a scenario where the original developer is just “trusting” information coming from ViewState. 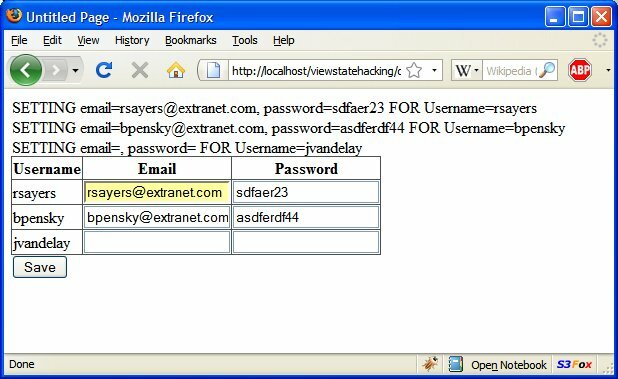 Here’s an example – a company ‘extranet’ application which gives me an admin page to manage the username/passwords of my subordinate users. 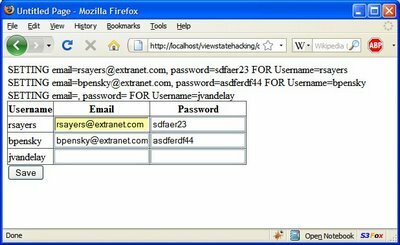 Let’s guess the “trusting” developer behind this system implements the save by iterating over the GridView rows, and updating the database with the emails / passwords in the textboxes. My superior’s login is ‘jvandelay’ – of course I’m not able to see his record on my admin screen. After a postback the page is being populated using the data stored in ViewState. 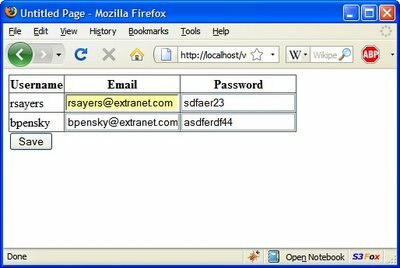 Can I craft up some viewstate that will add a row to the dataview, allowing me to update my superior’s password? Seaching around gets some good articles to answer my intial questions. 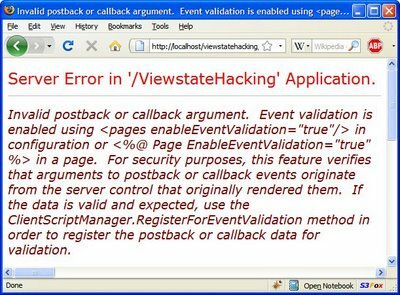 Can you falsify ViewState? By default: no – From ScottGu’s Cool Viewstate Decoder: “Note that ViewState is MAC (message authentication check) encoded to prevent tampering by remote clients. As such, while you can decypher the viewstate settings using the above program, you can’t actually change them and repost to the server.”. There is a setting “EnableViewStateMac” on the @ Page directive to switch this off, so we can have a play around. How do you craft up the ‘malicious’ ViewState? Let’s start with deserializing the ViewState using LosFormatter. Paul Wilson’s article provides a some code to traverse the object graph. See the results here. Now I can insert the objects into the object graph to fake an extra row in the ViewState. I’ve modified Paul Wilson’s code to give to generate code to access the unwieldy positions in the graph, see the code here. Posted by russ on Sunday, September 21, 2008, at 1:05 pm. 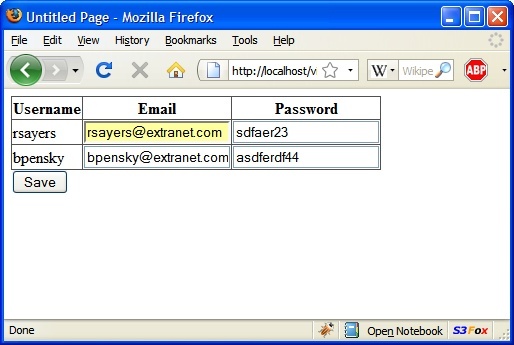 Filed under asp.net, security. Follow any responses to this post with its comments RSS feed. You can post a comment or trackback from your blog.